LIMA’s first birthday at the Wardrobe for Fuseleeds06. The LIMA Orchestra were as good as I expected them to be (and this means VERY good). Ken Vandermark and 2 of his Free Fall fellow musicians joined the Orchestra for the second half. Too many saxophones, incendiary grooves, virtuoso performances and excellent song titles (rubber band, pigeons in the attic, um I think you’re a semi-tone out…) made this one of the best performances I have ever seen at the Wardrobe. Thank you LIMA and happy birthday! To celebrate the first anniversary of their first “proper gig” (Colin’s own words), Minghe Morte have announced another feeder gig! Last year, it was cheese toasties; this year, it will be hot dogs. And of course there will be a bingo interval with hopefully more unique and exciting prizes (if I remember correctly, one of last year’s top prizes was a Minghe Morte chicken dinner for one). And if the promise of free hot dogs and bingo is not enough to get you down to the Packhorse on June 12, I have heard from reliable sources (Colin himself and the LIMA website) that Chris de Bezenac will be generating extra dirt with his brand new laptop. Yeah! This is an experiment with on-the-move wireless internet access. 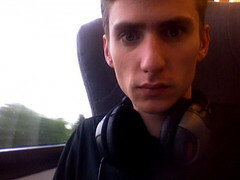 GNER offer wireless access (for a small fee) and I decided I’d give it a go. So here goes: a photo taken with my laptop camera, uploaded to Flickr via GNER‘s wireless connection and blogged via WordPress. And all this from the (relative) comfort of my seat on a moving train. I love technology when it works! Today was sunny and felt very much like spring. We have a few pots full of wall flowers in the garden so I took a series of close-up shots. I was very lucky to capture a bumblebee working its way through the flowers. Check my album for more flower and bumblebee photos. 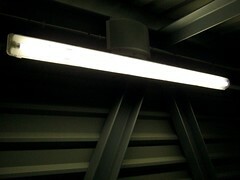 A nice neon light form inside an access tunnel at Liverpool airport. Nice shadows. I’m high up in the clouds, on my way to glamorous Limoges. I’m listening to DJ Olive’s set from Rhythm Incursions’ latest podcast and typing this post (offline of course, it’s only a Ryanair flight!). It’s great to be able to do all this while you’re flying through the clouds. This is my first out-of-the-house laptop experience and I’m really enjoying it. The air hostesses are as orange as usual with added gold accessory tack. It clashes beautifully with the bright blue Ryanair uniforms. One really disappointing thing about this plane: The windows are too mucky to take pictures. Rubbish! Man, someone’s wearing a really strong perfume. It’s hurting my delicate nose! I love my hoody. 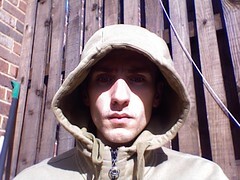 I took this picture with the iSight webcam of my new MacBook Pro. A while ago, I blogged about Rhythm Incursions, an excellent podcast from Resonance FM. Since then, I have discovered other equally good offerings from the station: Red Zero Radio and Hooting Yard. Via Resonance FM, I also discovered an excellent SF podcast called Escape Pod. Escape Pod podcast weekly quality SF stories and features. I’ve listened to 3 episodes so far and it sounds very promising. If you are into your Science Fiction, go listen to a story and become a subscriber. I took this picture while on my day at Ogden Water Reservoir. 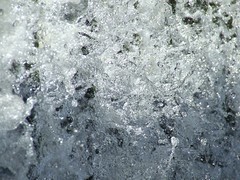 This is a close-up of a small waterfall. This post is also my first posting from Flickr so it is a bit of a test. Hello all! Or should it be “Hello me!”. Because as opposed to my other blog 1 Pixel Out, which gets about 9000 visits every month (Yeah! ), this blog is visited by mainly one visitor. And that’s me. Well, I do get the odd LIMA member visiting because of my extensive collection of reviews and photos of LIMA gigs. Talking about photos, I have finally decided to move my galleries to Flickr. I have even created a LIMA group where you can find all LIMA related photos (of course). Why the move to Flickr? Well, it’s a long story. I’m a web developer. I like writing my own web software and I’ve always had a tendency to dislike online services that offer hosted solutions for personal stuff. However, I have finally realised that this dislike is no longer valid. Why? Because the web has finally evolved into something Really Useful. The new wave of web apps like Flickr, del.icio.us or Technorati now offer really useful services and are also so powerful and easy to use that I feel totally comfortable using them for my personal stuff. Hence the move to Flickr. I am also a very recent Mac convert. I’m writing this post on my brand new MacBook Pro (which is also my first ever laptop). I am now totally in love with Apple software and hardware but I had to find replacements for the software I had on my Windows PC. The hardest transition was from Picasa to iPhoto. I think there is no doubt that Picasa is a superior piece of sfotware engineering but I was determined to find an alternative for Mac. With Picasa, I had my own template system to export my galleries as XML so I could publish them on this blog. After some extensive research and some playing around with iPhoto, I finally decided to give Flickr a go and maybe 5 minutes after creating my account, I fell in love with the whole concept. After uploading a few pictures and reaching my photo sets limit (3 for a free account), I upgraded to the pro account which is incredibly cheap ($25 a year!). This move to Flickr should mean that I will be posting a lot more photographs. By the way, I have a really good collection of shots from a walk I did last Friday (including the wind turbine shot from my last post). I will be posting them on Flickr and linking to them from this website soon. Hop Bof my friends! The future is bright, the future is tomorrow!